We don’t know much about Di’s life. I only hope this site draws out memories and information to put together a fuller story. In the mid-1980s I was living in Manchester. During this time I got to know a singer called Di Williams. She first came along to a folk club I ran with Lynne Percival at the Lamplight Club in Chorlton. 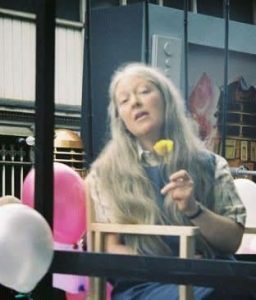 She seemed a slightly eccentric figure, in charity shop clothes and a shy gaze, but when she sang it was with the authority of someone who held a place in a folk tradition. She accompanied herself on untutored fiddle, simple guitar or, in most cases, nothing but the quiet power of her voice. The Lamplight was an early open mic, drawing young arty people who wanted to make an impression, but Di seemed slightly outside of all that, a woman who didn’t care about image or ambition. In 1983 she asked me to play on a few tracks for an album she was recording. She was working with an excellent guitarist, Dave Chisholm, who provided most of the backing. She used me on guitar and bass and a few other friends on fretless bass, mandolin and percussion here and there. We must have recorded some elements of it on my Portastudio 144, as I remember having Di and Dave up there, but other sessions were held in the huge recording room at BBC Manchester in Oxford Road, where her brother Alan was a recording engineer. 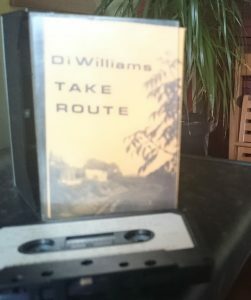 Alan produced the final album, Take Route, in cassette form only, which was the norm at the time. I remember playing a few gigs with her and Dave, notably supporting John Cooper Clarke at one venue. Clarke was the antithesis of his image – friendly, quiet-spoken and gentle, until the shades went on and he walked on stage sneering and snarling as the persona took over. In 1987 I left Manchester and I never heard from, or of, Di again. Hil tells me Di played in a 1980s women’s band called Beyond the Glass, with the Wolstenholme Sisters. There are mentions of her here and there in Manchester and Stockport folk club websites I’ve found. She’s referred to variously as Diana Moussa and Diana Moussa Williams, which I believe was her married name. Diana Moussa (Williams) Passed away suddenly on 16th February 2015, aged 64 years. Dear daughter of the late Enid and Penry Williams and much loved sister to Julia, Richard, Alan and Ivor. Diana will be sadly missed by all her family and friends. If you can provide any facts, memories or pictures please contact me via the comments below or Hil Bichovsky via her Bandcamp site.